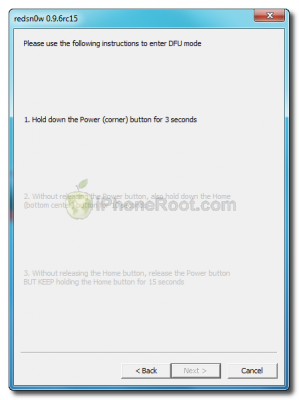 This is step-by-step instructions on how to perform untethered jailbreak of your iPod Touch 3G on iOS 4.3.3 firmware using RedSn0w 0.9.6 rc16 for Windows. UPDATE: Please, consider reading our Jailbreak & Unlock FAQ, especially if you have questions or troubles. Important information. Please think first, before you do something. Extract the redsn0w executable from the RedSn0w zip file into the same folder. If you are already on iOS 4.3.3 you can skip this step. 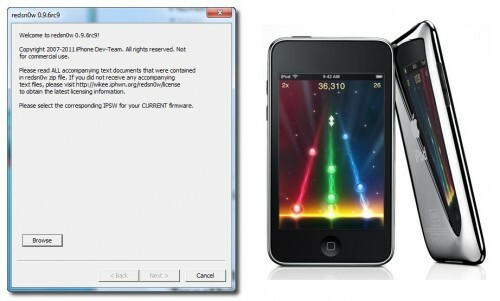 UPDATE: Apple released iOS 4.3.4 that is only tethered jailbreakable with redsn0w. 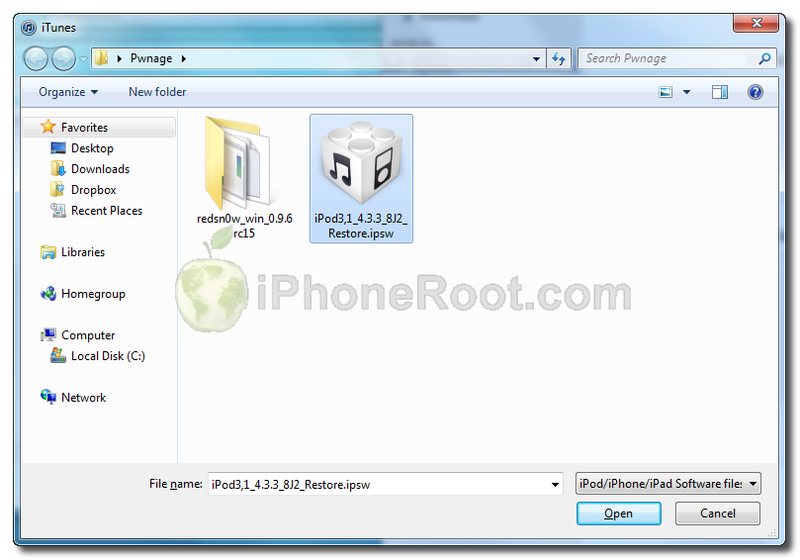 Apple has stopped signing iOS 4.3.3, so you can NOT restore to 4.3.3 any more (both original and custom), unless you have saved your SHSH keys for 4.3.3. If you are on 4.3.3 just go to Step 3 and jailbreak. You can try to use jailbreakme on earlier iOS, but we have not tested it. Update to iOS 4.3.3 only is you have iOS 4.3.3 SHSH keys saved. 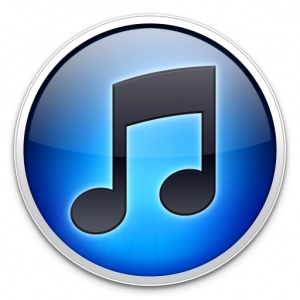 Connect your iPod Touch to the computer and launch iTunes. 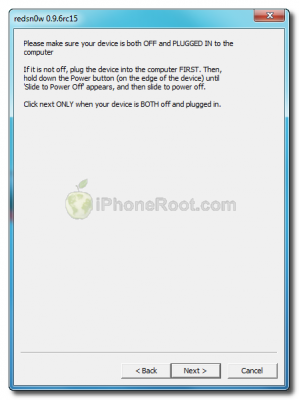 Create a backup, since all your data on iPod Touch will be erased. Select your iPod Touch from the list of devices on the left. 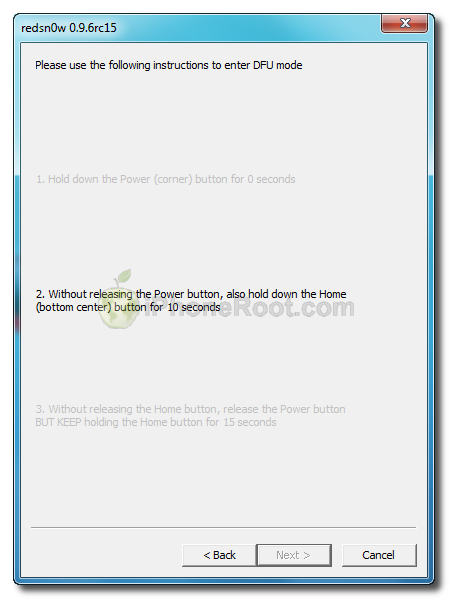 Now hold down Shift and click the Restore button. 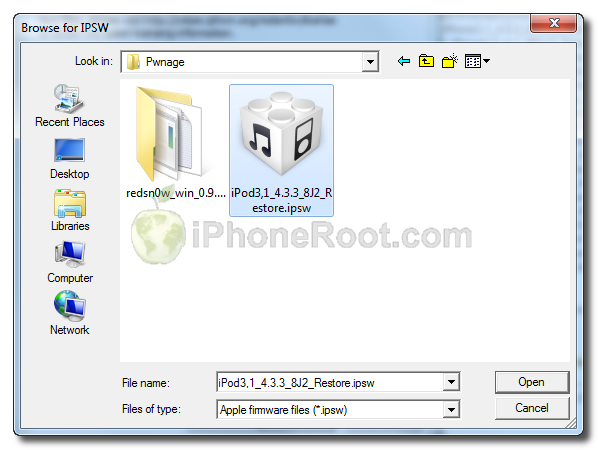 Restore is preferred as it won't create any wasted space on your iPod Touch. Navigate to the Pwnage folder on your desktop and select the 4.3.3 firmware ipsw. Click the Open button to continue. 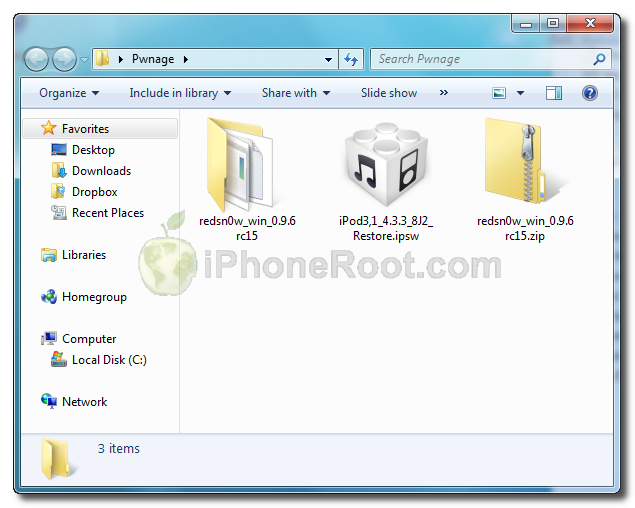 Once iTunes has finished updating your iPod Touch to the desired firmware open the Pwnage folder on your desktop and launch the redsn0w application from the redsn0w folder we extracted earlier. On Windows Vista or Windows 7 right click the executable and set it to run as administrator in Windows XP compatibility mode. 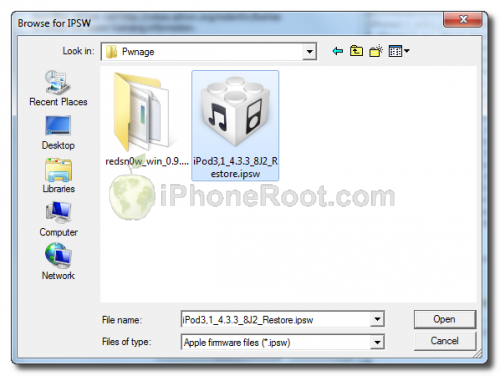 Select the 4.3.3 firmware ipsw we placed in the Pwnage folder on our desktop then click Open. Once the firmware has been verified click the Next button to continue. 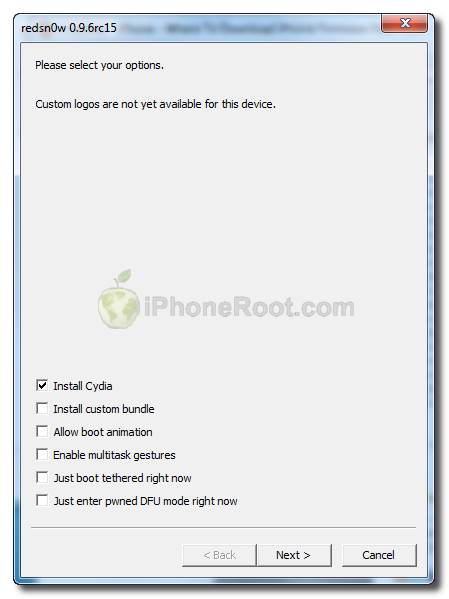 From this window you can select the jailbreak options you would like. 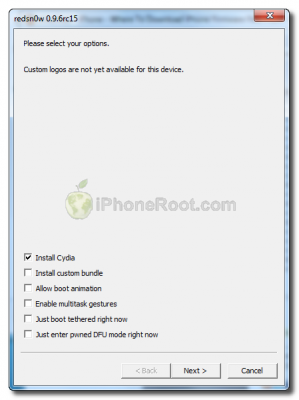 Make sure Cydia is selected. RedSn0w will now guide you through the steps to get into DFU mode. 1. Hold down Power button for 2 seconds. 2. Without releasing Power button, hold down both the Home button and the Power button for 10 seconds. 3. Release the Power button and continue holding the Home button until RedSn0w detects the device. RedSn0w will then begin uploading the new RAM Disk and Kernel. Once this is complete you will be notified that RedSn0w is done. Click the Finish button. When your iPod Touch finishes rebooting (5 minutes or so) it will be jailbroken with Cydia on the SpringBoard. When your iPod Touch has restarted you can run Cydia. Let it do all the necessary updates. 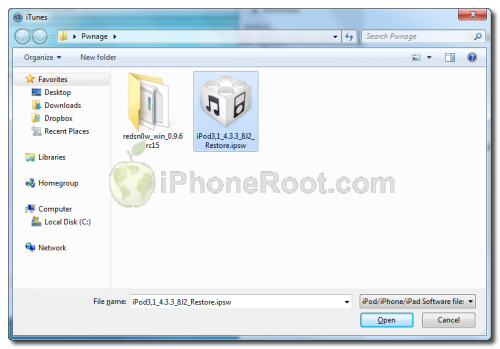 To have access to the root file system of your iPod Touch (via file managers like iFunBox or iPhone Explorer) install application called afc2add in Cydia. Do not forget to change your default password if you've installed openssh.